Pizza Style: St Louis thin crust. The Skinny: Ask for mozzarella, build your own can get pricey. Price: $9.50 for a small cheese (12in) to $16.49 for large Tocco Special (16in). Chief Pizza eater says: Recommended BUT. Frankie Tocco's was recommended to me about 2 or 3 years ago, but not until recently was I able to put myself at their door. 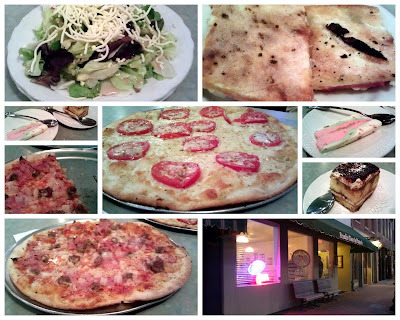 Frankie Tocco's, making pizza's since 2005, is located towards the north end of Main Street in historic St Charles, MO and is neighbors with quite a few excellent restaurants. We arrived around 6 P.M. to find the main dining room completely full and several people waiting for tables. Luckily they have a second dining room downstairs and there was only 2 pizza eaters, so our wait was short. We started the meal with a large Frankie House Salad and two plates, it could have served 3 or 4. It had Iceberg lettuce, spring mix, tomatoes, Provel cheese and pepperoncini. We choose the House dressing a sweet red wine vinegarette. It was very good, even the Provel cheese. A salad is probably the one place that Provel cheese works really well in my opinion, keep it off my pizza, and throw it at a salad. For pizza we ordered 2, both St Louis style Thin crust as thats all Frankie Tocco's makes. The first being a small Margherita, it had extra virgin olive oil, fresh chopped garlic, mozzarella cheese and sliced tomatoes. The second was a small pepperoni, hamburger, Canadian bacon and onion. I also requested mozzarella cheese instead of the Provel. I really enjoyed both pizza's especially the fact that they make and roll the dough there. The hand made crust makes a difference. I think my normal pizza (lots-o-meat and onions) works better on the thin crust than the Margherita. But even with that said I would still order it again in the future. We saved room for dessert so that meant I had leftover pizza for breakfast the next day and after a short visit with the toaster oven it was still very good. For dessert we choose the Tiramisu and Spumoni. Both were about the proper size to share between 2 pizza eaters or 3-4 dainty eaters. Both were very good, the Spumoni being my favorite. I really enjoyed the food and the service was very good, but I have one small nit-pick. The build your own pizzas add up quickly, a small one topping is $10.25 plus $2.00 per topping there after. That made my small 4 topping pizza $16.25 plus tax, that's $.24 less than a large Tocco Special (5 toppings). Outside of that... I had a great meal. Recommended but... beware of the build your prices, the Tocco Special is by far the better deal. Pizza Style: Thick and thin. The Skinny: Beware the Claw Machine. On a weekend not long ago I promised my young pizza eater that I would take her and a couple of her pizza eating friends out for lunch. 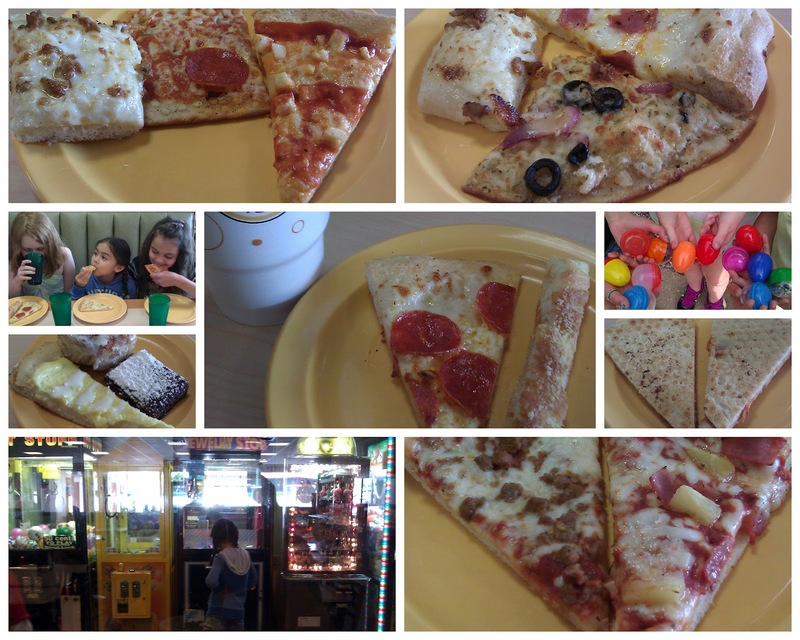 It's not always easy finding a pizza joint that is acceptable to both young and old, CiCi's was acceptable to both parties. CiCi's probably wouldn't be my first choice if I was just getting pizza for myself, but I figured I should take advantage of the situation, so I did my best to try at least one slice of every pie on the buffet. There was everything from cheese, pepperoni, ham & pineapple to veggie. For crust there was your standard thin crust, similar to a Papa John's or Domino's, Thick crust (I would call it pan) and ultra thin and crispy. After trying them all I came to the conclusion that the thick crust with olive oil, mozzarella and sausage, and the ultra thin crust pepperoni were the best. At the end of the buffet is the dessert pizza... or dessert that is baked in the pizza oven, including: brownie, cinnamon roll and a pizza crust cheese cake (It was a little vague but I'm pretty sure it was cheese cake). Of the three the cinnamon roll was by far the best, with the brownie coming in a close second. There was also a very small salad bar and pasta bar before the pizza, but I didn't partake as I knew I would be eating way to much pizza. The salad bar look plenty fresh, but I'm not sure how well the pasta would do sitting on the buffet. Once everyone had their fill of pizza it was off to the Game Room (aka: Claw Machines). For pizza eaters under 10 the claw machines have a unbelievably strong attraction. If given the chance I'm sure they would have spent more on the machines than the pizza. The pizza wasn't bad and the young pizza eaters all found something that they liked, but beware the Claw Machines as they can quickly take the value out of meal. Recommended BUT, beware the Claw Machines. Schlafly Bottleworks February 2012, Birthday Pizza. It is that time of year when the Chief Pizza Eater gets to be another year older, rounder and shorter. That means birthday pizza. I had a couple of places in mind, but one was surrounded by the Mardi Gras celebration and the other I found out was no longer in business. So after a bit of back and fourth I decided on Schlafly Bottleworks in Maplewood, MO. I have reported on Schlafly Bottleworks a couple of times in the past so I won't bore you with all the details. As in the past the food and service was excellent. I ordered a Bison, pepperoni and red onion pizza with the house blend cheese and on their hand tossed Pilsner dough crust and it was delicious. (WARNING, non-pizza content!) Just to mix things up Mrs. Chief Pizza Eater ordered the Meatloaf. I have tried unsuccessfully several times to order the Meatloaf only to be told, sorry we only serve it during supper, or sorry we have already sold out of the Meatloaf, etc. 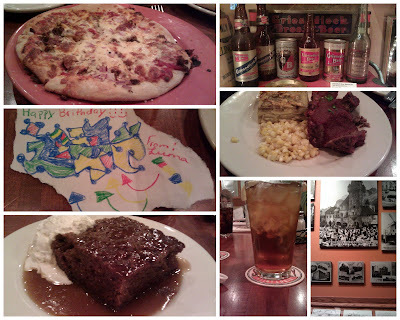 So of course the day I want to order pizza they have plenty of meatloaf, it was also excellent. For dessert the table of 11 mostly non-pizza eaters shared a Sticky Toffee Pudding. There just isn't much better way to end a birthday meal that the Sticky Toffee Pudding. While doing our weekly Grocery Shopping I had a moment of weakness, and found a Culinary Circle Ultra Thin Crust Margherita Pizza (and a Ultra Thin Pepperoni Pizza, but it's still in the freezer. 2 for $5 what can I say...) in the grocery bag when I got home. Not a brand from my youth, but what the heck. Culinary Circle's pizza has an "olive oil based sauce topped with mozzarella and Parmesan cheeses, vine ripened tomatoes and basil", that's what the box says. The box doesn't look all that big, but once the pizza is out of the box it looks huge compared to the pizza. following the directions on the box the pizza is done in less than 15 minutes. As with most frozen pizza the final product didn't really look as good as its packaging. As far a taste, well it was okay. We didn't have any left overs to deal with, so it couldn't been to bad. Culinary Circle is a Supervalu brand and is sold at Shop'n Save in my neck of the woods, so if you don't live in the St. Louis Metro area and you can't live with out trying a Culinary Circle Ultra Thin Crust Margherita Pizza goto Supervalu.com and find a store in your area. Back in the day when the Chief was a young whippersnapper, he survived for weeks (maybe months) at a time on something called Frozen Pizza. Today when the Chief looks back on his misspent youth he has fond memories of Frozen Pizza. So going forward from time to time he will revisit his youth and throw some Frozen Pizza your way. Can it ever be as good as it was? Tony's Pizza Palace, Columbia, MO. January 2012. 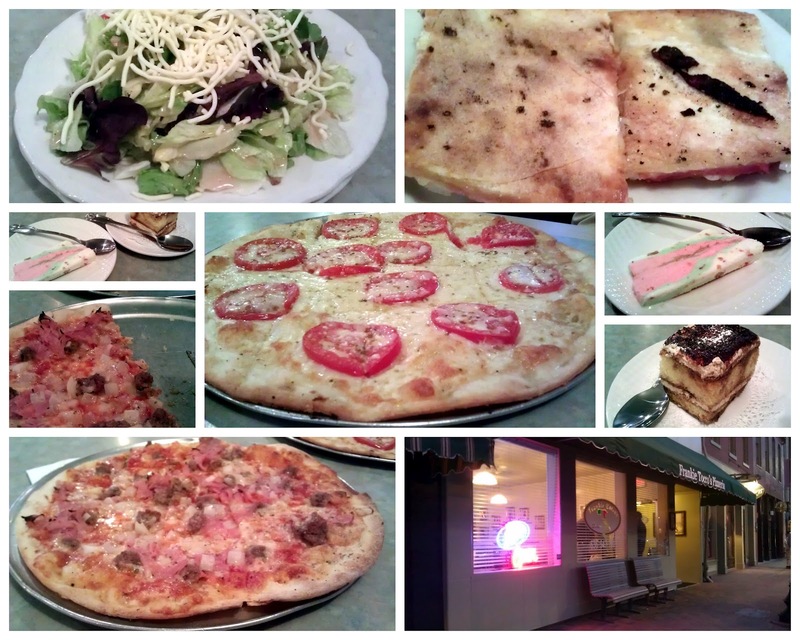 The Skinny: Another great Greek Pizza Joint in COMO. 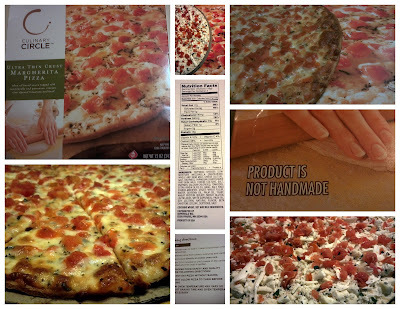 Price: $16 Medium 4 topping Pizza. Chief Pizza eater says: Recommended. When ever I find my self in Columbia I try to find my way to a pizza joint, it doesn't always happen, but when it does I've yet to be disappointed. This weekend was no different. 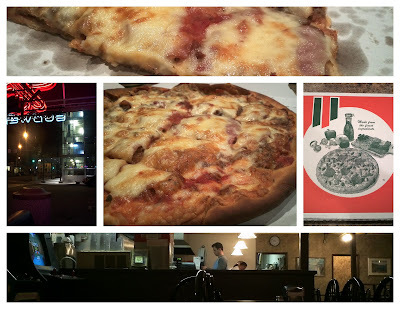 I had been told about Tony's Pizza Palace last year by an old friend and kept it in the back of my mind until I had the chance to get there. Tony's doesn't have a web-site that I could find, but from what I gather they have been in business since 1968. Originally they were located on Broadway, now they are on the corner of East Walnut and North 5th street. The current location appeared to be clean but well used. Tony's makes pizza with Greek Style crust, a thin crust usually cooked in a pain. I ordered a medium pepperoni, Canadian bacon, hamburger and onion pizza to go. About 15 minutes later I was heading out the door with a hot pizza, and the drive to where I was staying was torture The smell was driving me insanely hungry. When I finally got the box open I found it similar to other Greek pizza joints in that the toppings were all under the cheese and there was a little fold on the edge of the crust. It had and abundance of toppings and cheese. There is a seasoning in either the sauce or hamburger that I just can't pinpoint that sets the pizza apart from what you would find in a more Italian orianted pizza joint. All and all a great pizza. On stop 13 of the 2011 Binge, I once again found my self with a car full of non-pizza eaters. That didn't stop last time and didn't stop me this time. A'mis Italian Restaurant in Rock Hill was stop 13. For starters we had a A'mis salad with the House dressing. We were all quite hungry, so I completely for got to snap a photo. I will tell you it was more than enough shared between 3 people, and could have served 4. It was also quite good, especially the House dressing. I did get pizza, a hand tossed crust with salami, hamburger and onions. From the first bite to the last it was excellent. 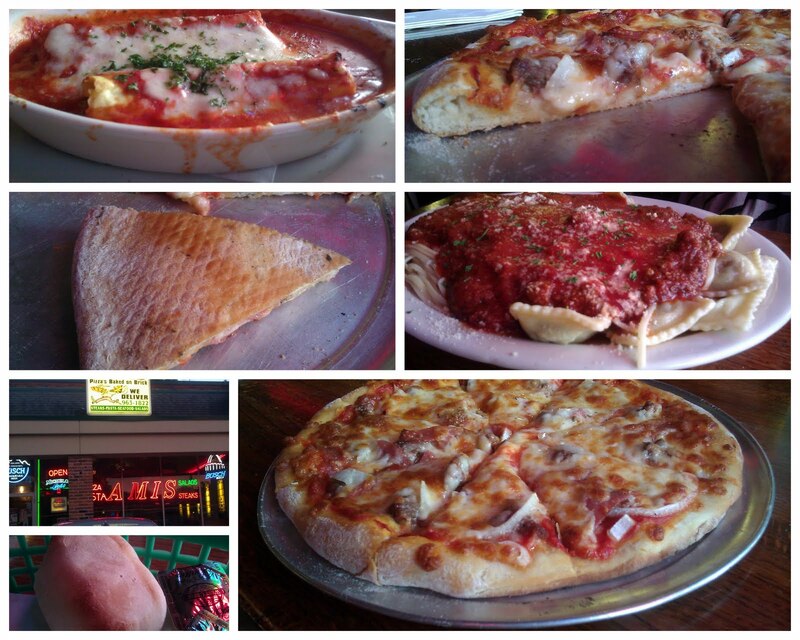 Some day when I have more pizza eaters with me I'm going to try their Chicago Deep dish, next time.